Roys restaurants are renowned for their upscale exotic Euro-Asian fusion cooking. Chef Roy Yamaguchi opened his first Roy’s in Honolulu 22 years ago and today his haute-cuisine chain stretches from Atlanta to Tokyo. I stopped by the Rancho Mirage location, which opened in 2002, for a sampling of the Hawaiin fusion cuisine and to include the review in an upcoming iphone application. The 7,,200 square foot location features and exhibition kitchen, a lounge area, bar seating and an outdoor patio. Here’s what my friend Chris and I sampled. 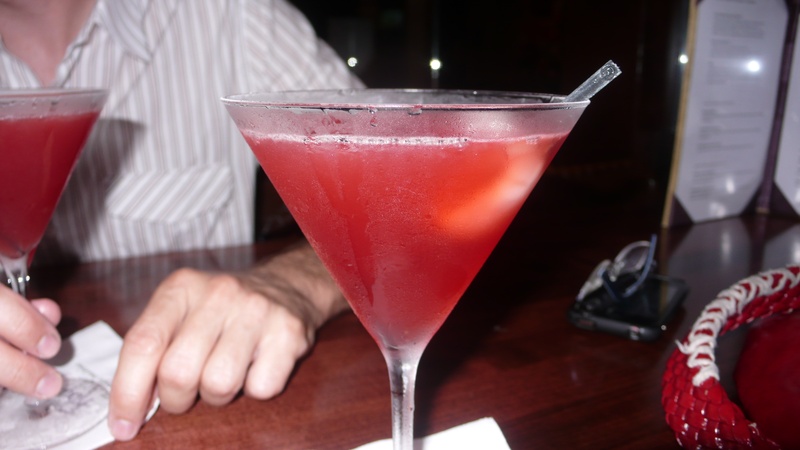 We headed to the bar and tried their famous “1988” drink, a blend of tart grapefruit and tangy pomegranate with Ruby Red Vodka, Lychee Liqueur and Patron Citronge Liquor. 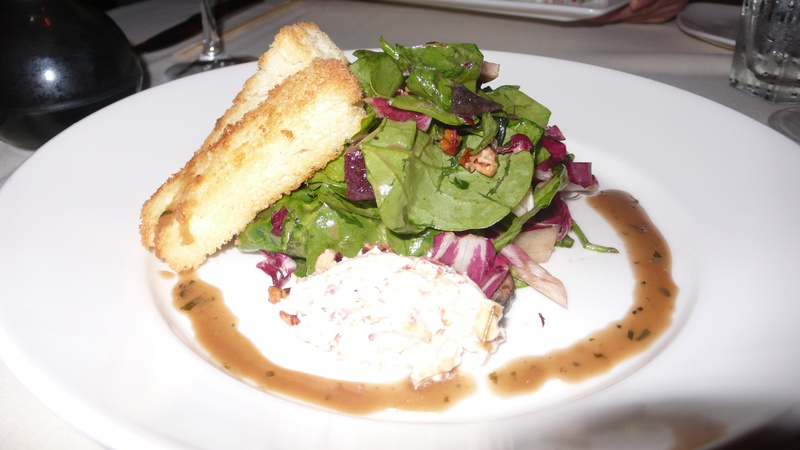 Strong and tangy and a great way to start off the meal. 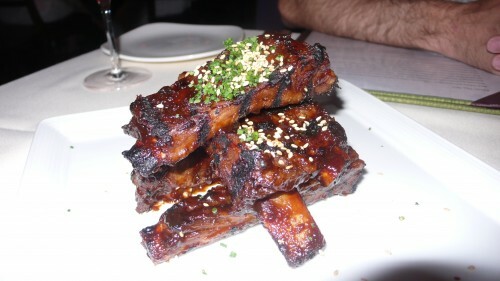 Our waiter brought out some Szechuan spiced pork ribs from the chef. These are smoked and grilled in a mongolian sauce and were spicy and good, and a huge portion. 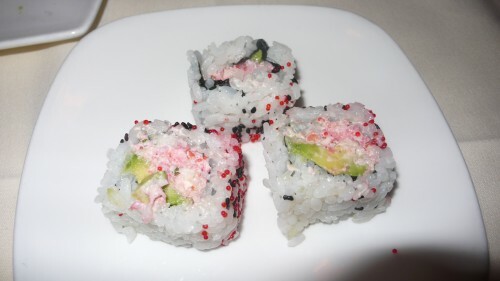 I am a sucker for a good California roll and these included avocado, cucumber and lobster and were fantastic. Also a huge portion so plenty to share. Chris got their garden salad which was a basic simple salad, but a good pair for the lobster rolls if you are sharing like we decided to do. I ordered the combination surf and turf, a petite filet mignon, lump crab oscar on top and a Maine lobster tail. It comes with a poblano mash and asparagus. 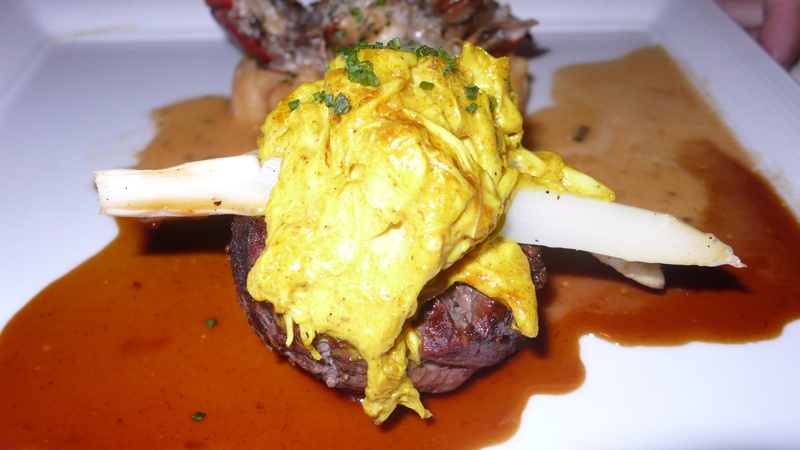 I thought the filet was very good and cooked perfectly. 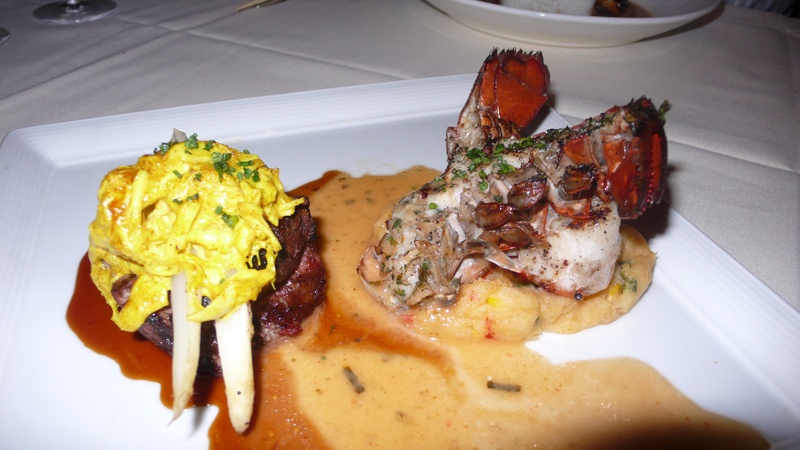 I would order the lump crab oscar on the side next time as the sauce was a little strong for me. 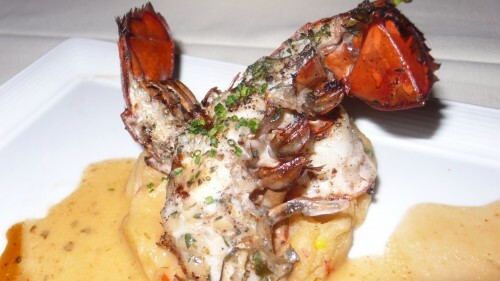 The lobster tail was cooked well and had a ton of lobster meat. 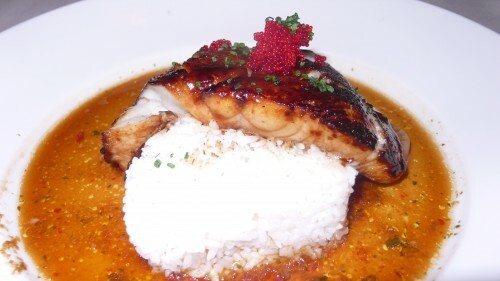 Chris tried their signature Misoyaki Butterfish, very similar to a sablefish or cod. It comes with a tri-pepper soy vinaigrette. We both really liked this dish. For dessert we were served Roy’s melting hot chocolate souffle, a flourless chocolate cake with a molten hot center served with vanilla ice cream and a raspberry sauce. 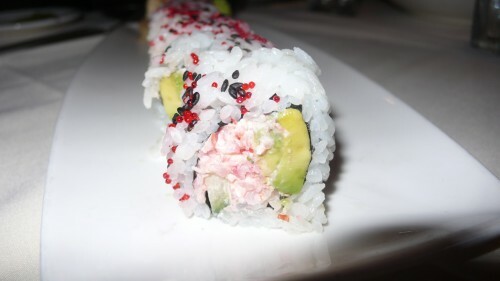 This was delicious. 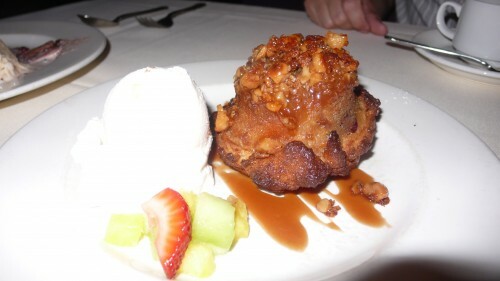 We also were given a bread pudding. 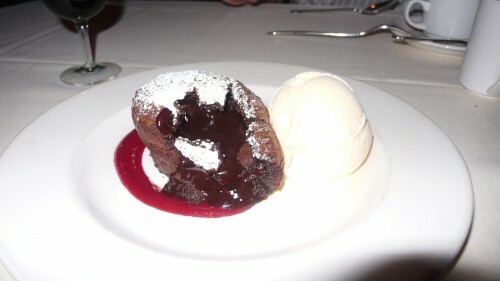 This was also yummy, but we were so full we took it home to Paul and he finished it immediately. Roy’s restaurants can be found in varies cities, including locally in Pasadena, so you don’t have to travel to the islands when you get a craving for traditional Hawaiian fusion food. 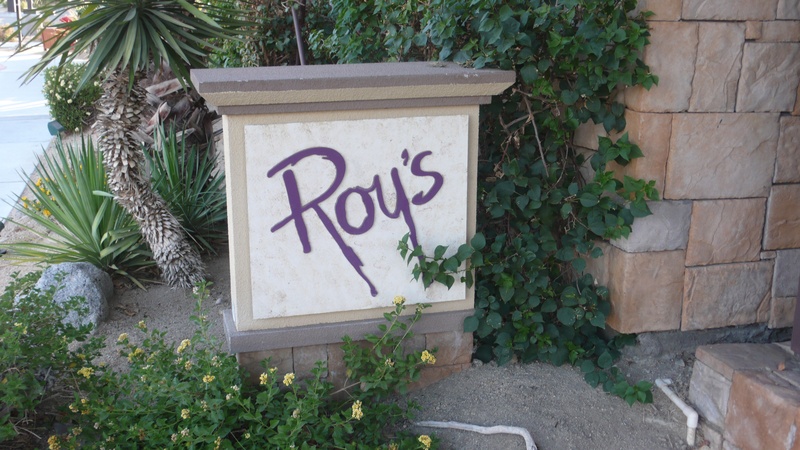 Roy’s Rancho Mirage is located at 71959 Highway 111, reservations recommended at 760/340-9044.